Looking for a simple fish recipe for dinner? 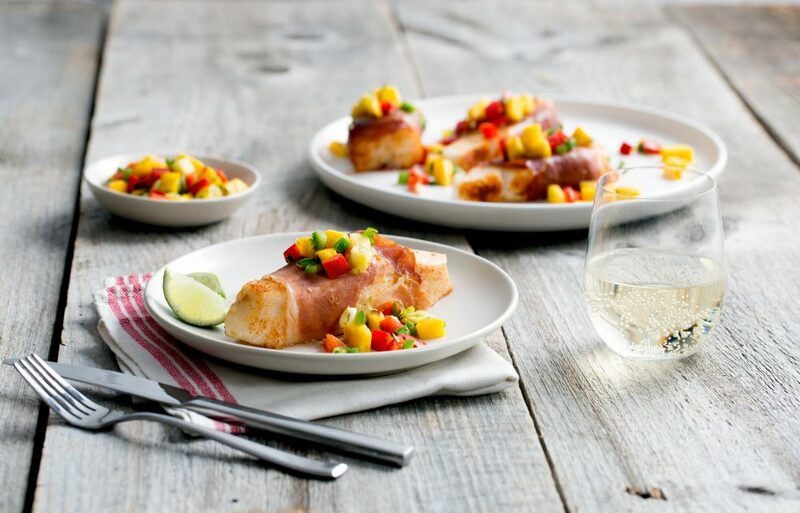 Have no fear, this Prosciutto Wrapped Fish with Tropical Salsa has everything you’ve dreamt of for a light, summer meal. The flaky Chilean sea bass (or your favorite white fish) complements the robust flavors of the Prosciutto di Parma, all of which are further accentuated by the fruity yet slightly spicy tropical salsa. An extra bonus? This prosciutto wrapped fish is baked in the oven, so rid yourself of any doubts about cooking skills. Enjoy this dish with a light Italian wine, head outdoors, and enjoy the season. In a small bowl, combine garlic powder, onion powder, paprika, cumin and cayenne pepper. Season all sides of the sea bass with the mixture. Wrap a slice of prosciutto around each sea bass filet and arrange on baking sheet top side down. Cook 10-12 minutes, turning once (so that top side is now facing up), or until fish is cooked through and flakes with a fork. Meanwhile, in a small bowl, combine mango, pineapple, bell pepper, scallion, jalapeno, cilantro, garlic, lime juice, zest, oil and kosher salt. Transfer sea bass fillets to a platter and top with salsa. Also delicious with Mahi Mahi!